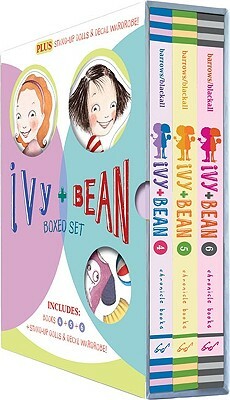 Ivy and Bean, two friends who never meant to like each other: This boxed set, Ivy and Bean Boxed Set 2 (Books 4-6) continues the story of these two spunky characters. It includes the second of three books in the Ivy and Bean series. Book 4: Ivy + Bean Take Care of the Babysitter : What's the worst babysitter you can imagine? Okay, now multiply by a million. Bean's just found out that Nancy is babysitting for the afternoon. After Ivy rescues her from prison, the two girls turn tragedy into opportunity. Book 5: Ivy + Bean: Bound to Be Bad: Ivy has decided to become good. Extra-super-duperly good. Bean figures that's a big waste of time-until Ivy explains that if you're really good, animals and birds follow you around. Wow! Animals and birds! Bean's going to be good, too! They're going to be nice; they're going to be sweet; they're going to be kind and generous and-Wait a second! How did they end up muddy, wet, and in trouble? Book 6: Ivy + Bean: Doomed to Dance: Ooops. Ivy and Bean have made a terrible mistake. They thought that ballet meant leaping, kicking, and cool costumes. Instead, it means they're going to have to be The Two Friendly Squids in a ballet the teacher made up. How embarrassing. As disaster looms, the girls come up with a great escape plan. It's an easy plan, a simple plan, a beautiful plan. It only involves a field trip, a couple of sharks, and some weird animals that glow in the dark.